I've talked before in presentations that the ASP.NET and Web Tools team has been slowly externalizing pieces of ASP.NET. You've seen it in many pieces of the ASP.NET runtime moving into NuGet while also being open sourced, and you've seen it as we've moved big chunks of the "tooling" (that means the menus and dialogs you interact within Visual Studio when using ASP.NET) into external installers. Why are we doing this? Because the Web moves faster than Visual Studio does. We want to be able to offer a stable ASP.NET core that you can count on while being able to offer new and powerful features more often as needed. Visual Studio itself has moved to a faster update model and recently released Visual Studio 2012.1 (that's Visual Studio 2012 Update 1 if you prefer.) You can get the VS2012.1 update here or just wait for Visual Studio to popup some toast and let you know. We're going to release an update to ASP.NET we'll call ASP.NET and Web Tools 2012.2. This will happen early next year but today you can download our Release Candidate! You can watch my presentation with Jon Galloway from the BUILD conference or read the release notes. This RC is, of course, newer than the one we released at BUILD and has a better name. Enhancements to Web Publishing unifying Web Application and Website project publish experience. Selective publish, local/remote diffs and more. New Web API functionality including support for OData, tracing and generating a help page for your API. You can create Facebook apps using the MVC Facebook template. In just a few easy steps you can create a Facebook Canvas Application that gets data from the logged in user as well and with friends. Real-time communication via SignalR. This means SignalR, in case you haven't heard, is a real and official thing. It's fully supported by Microsoft. Extensionless Web Forms via ASP.NET Friendly URLs which makes it easy for web forms developers to generate clean URLs without the .aspx extension. This can be used with existing ASP.NET 4.0 applications as well! FriendlyURLs also makes it easier for developers to add mobile support to their applications, by supporting switching between desktop and mobile views. Editor support for Knockout IntelliSense and pasting JSON as a class. ASP.NET and Web Tools 2012.2 installs quickly and does NOT alter the current ASP.NET run time components or change the GAC. For a complete description see the Release Notes. ASP.NET Fall 2012 Update for Visual Studio 2012 can be installed from the Fall 2012 Update home page(http://www.asp.net/vnext/overview/fall-2012-update). This is an update to Visual Studio 2012, which is required. This Release Candidate update does not support localized versions yet. You see the new features in English but we'll will have localization support in upcoming RTM. It is an RC so there are some known issues. Be sure to check out the Release Notes for issues and workarounds. Also be sure to get our "labs" component for Web Developers called Web Essentials. This is a place for Mads and the team to try out new features and play. When those features are baked, we'll graduate them to an update like this one! Why isn't this called ASP.NET 4.6? Because it's not. The GAC'ed ASP.NET 4.5 doesn't change. This is mostly a tooling update as well as a collection of NuGet-based libraries that augment but don't replace ASP.NET 4.5. If we called if ASP.NET 4.6 then folks would think they needed to rush to update their servers. They don't. It's an update for "Web Tools for VS 2012" but that's lame, so since we got the VS guys to use the .1, .2, .3 scheme rather than September Update CTP Refresh, then we can make things easier by calling this Web Tools 2012.2. This .2 release is just a step towards a more componentized "One ASP.NET." I hope you enjoy the direction we're heading. We've got some new things planned like a unified "File New ASP.NET Application" dialog, a better way to add your own templates and share them with the community, and a more level playing field for everyone. Jason Zander announced today that Visual Studio 2012 and .NET Framework 4.5 is RELEASED to web. The .NET Web Tools Team (the team I'm on) has coverage on their blog as well. I thought I'd showcase some Tiny Happy Features that the team worked on just because it made life better. Some are large some are small, but all are tiny happy features. I'll continue for a few more Tiny Happy Features over the next few weeks but this last week I took some time and recorded 13 (ya, thirteen, oy) short videos to show you guys these features in action. These are SHORT videos that are at most 4 to 6 minutes. It's hard to watch 60 to 90 minute screencast so I did these little one-take quick shots so you could watch them at lunch. If you watch all these videos it will take you less than an hour and you'll have a good practical idea of what's new in Web Development and Tools with Visual Studio 2012. This is by no means exhaustive, but it's a lot. The other concept that's worth pointing out is One ASP.NET. 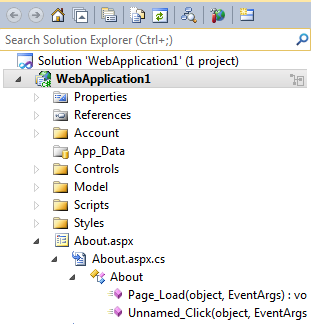 We've pulled the Web Tooling and Templates out into extensions in Visual Studio 2012. This means we can update Web Tools without updating all of Visual Studio. I talked about this in the One ASP.NET keynote at aspConf. We'll be updating the tools - not in major scary ways - but in useful and important ways that make front end web development easier. We'll look at small updates either quarterly or maybe semi-annually so when a new technique comes out you don't have to wait for the next version of Visual Studio. MSDN Subscribers can download now at the MSDN Subscriber Download Page. For volume licensing customers, Visual Studio 2012 products will be on the Volume Licensing Service Center tomorrow. If you want to download Visual Studio 2012 free trial versions, or to download the free Express versions, head over to the the Visual Studio product website. It's also worth noting that the Windows Azure .NET SDK has been updated today as well and you can download versions for either Visual Studio 2010 SP1 or Visual Studio 2012. Here's the 13 short videos showing each of my favorite features in just a few minutes. There are new Entity Framework 5 videos as well, so be sure to scroll all the way down! CODEC NOTE: These are using HTML5 video and MP4. If you are using a browser that doesn't support that codec, click the Header links to go to the ASP.NET site directly and the videos will stream with Silverlight. There are also 5 new Entity Framework videos done by Rowan Miller that show new features of the new Entity Framework 5 as well as walk you through Code First vs. Model First vs. Database First. They are excellent screencasts and I recommend them. I am creating a new database - Use Code First to define your model in code and then generate a database. I need to access an existing database - Use Code First to create a code based model that maps to an existing database. I am creating a new database - Use Model First to define your model using boxes and lines and then generate a database. I need to access an existing database - Use Database First to create a boxes and lines model that maps to an existing database. Enum Support in Code First - The domain classes that make up your Code First model can now contain enum properties that will be mapped to the database. Enum Support in EF Designer - Using the EF Designer you can now add enum properties to your entities. Spatial Data Types in Code First - Spatial data types can now be exposed in your Code First model using the new DbGeography and DbGeometry types. Spatial Data Types in EF Designer - Spatial data types can now be used in the EF Designer using the new DbGeography and DbGeometry types. Table-Valued Functions - Table-valued functions (TVFs) in your database can now be used with Database First models created using the EF Designer. Multiple Diagrams per Model - The EF Designer now allows you to have several diagrams that visualize subsections of your overall model. This allows larger models to be broken up into multiple smaller diagrams. You can also add color to the entities to help identify sections of your model. While all of you Build attendees are making me feel bad because you have a fancy Tablet and I don't (sell me yours!) 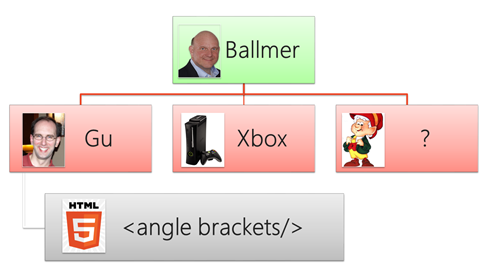 the folks over here in the "Angle Brackets Team" (I'm trying out some new names. One will stick.) have been busy. Here is a summary of all the items from our team that have been announced and shown at Build this week, all of this will be publicly available today (9/16) along with a some narrative and asides from yours truly. One of the things I am am personally enjoying in working daily with this build of Visual Studio is that there's dozens (hundreds) of little "mental speed bumps" that are smoothed over. A lot of thought was put into workflow and common scenarios in order to, well, get out of a developer's way. Another constant source of happiness on my part is the team's realization that not everyone can upgrade their Visual Studio, so you can round trip your projects and solutions. I can use Visual Studio 11 Developer Preview and open a .NET 4 application, save the project, and then open it in Visual Studio 2010 and it'll just work. As it always should have. Teams can mix and match and the beta guy can be wacky without checking in solution files that will break the other folks. By the way, have you seen our new org chart? Scott Aside: It's also worth noting that while there is a bunch of stuff in the next version of Visual Studio, there's an equally compelling amount of stuff being released from the Azure/Web Team on NuGet. This gets to my LEGO analogy where we developers have more choice of what we snap together. Most importantly many things will only live on NuGet. I'm looking at the possibility of NuGet Feed of Supported Microsoft Products. Folks sometimes assume that NuGet is a place to throw binaries up because it's convenient, but we also need a way to know if a NuGet package is actually a support product, kind of like "Verified" is on Twitter. I'm interested in your thoughts on this in the comments, or even better, in the Discussion Tab on the NuGet project site. Shipping via NuGet is also significant because it helps level the playing field with Open Source libraries. Microsoft's open source libraries will "compete" for our developer-attention by all being in NuGet, and folks should use the ones that make them happy. If you want to use Microsoft's Ajax Minifier or any of a half dozen others, then just get the one you want from NuGet. Microsoft's won't ship out of the box. It'll be on NuGet. Tuesday the "Windows 8 Express" version of Visual Studio was released with the Windows 8 Developer Preview release which supports Windows 8 development. Wednesday during the keynote with Satya Nadella, Scott Guthrie, Jason Zander Visual Studio 11 Developer Preview and .NET 4.5 were announced. The bits are available today to the public. Scott Aside: I continue to put gentle pressure on all the teams about semantic versioning. In this case, .NET 4.5 is the right version number. It's using the .NET 4 CLR and is an additive (with bug fixes) release to .NET 4. Because it does that, it's very compatible. Your existing .NET 4 stuff won't (shouldn't) break. Check out the Target framework dropdown in this version of Visual Studio. See how you can target from 2.0 to 4.5 with the same IDE? That will be useful for corporate customers who need to develop 2.0 apps but still want the IDE improvements. Visual Studio 11 Developer Preview includes new lots of new functionality including full editor support for CSS 3, full editor support for HTML 5, full editor support for JS, and many niceties like how Web Forms events can be wired up in source view, Web Forms designers can be launched directly from source view, how Live Inspector (code named "Eureka") makes editing the HTML of your document live much easier by automatically finding the HTML in your document as you select it in the Browser and much more. Scott Aside: They've leveled the playing field across all the editors so things like regions, collapsing hierarchies, commenting, formatting, etc are all the same between CSS, JS, HTML and code. One more reason to just turn off all your foolbars and embrace the text editor and code. We just published an update to NuGet 1.5 that supports Visual Studio 11 Developer Preview. This allows developers on the Preview builds to continue to use NuGet with the preview releases of Visual Studio. Note: NuGet does not support the "Windows 8 Express" release that was released yesterday. Support was just recently added to that SKU of Visual Studio and will appear in the next public preview release of "Windows 8 Express". This method supports a GridView that can sort, filter by category, and search via URL. Note the use of a nullable int as well. It makes WebForms code a lot cleaner, and it's just one example. Scott Aside: ASP.NET 4.5 is additive to ASP.NET 4, so your existing apps will run, of course, but you can just start using these new features once you're using 4.5. I've been able to "refactor via subtraction" and yank out a bunch of tedious monkey code. One other thing I wanted to say. It's becoming clearer to me that it's less about WebForms or MVC or WCF WebAPI Services or OData or IHttpHandlers or SingalR and more about ASP.NET. 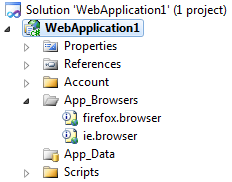 I used to call mix-and-match apps "hybrid" applications, but now I'm realizing they are just ASP.NET applications. I'll use whatever LEGO piece(s) I want and you should also. 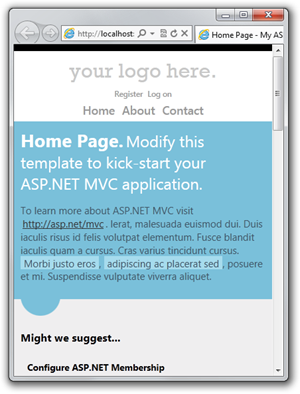 ASP.NET MVC 4 Developer Preview is the latest release of our MVC framework. This release includes built-in support for mobile sites, new, fresh HTML5 project templates as well as jQuery Mobile. It has enhanced support for asynchronous methods, and custom code generation. Scott Aside: Web Pages is what Rob and I used to make http://thisdeveloperslife.com and I'll be doing http://hanselminutes.com over again in Web Pages in the next week or so. If you love Razor just want a simple site, write code, hit F5, and deploy, WebMatrix and Web Pages is a nice change of pace. Also, the fact that they were able to integrate node.js into WebMatrix is not only cool but it brings up interesting questions about WebMatrix and what is can be used for. You can do PHP on it too, you know. Hm. 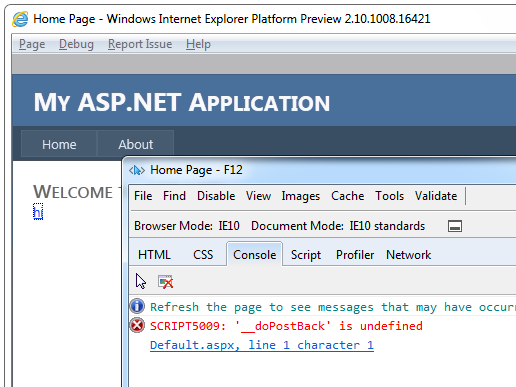 WCF 4.5 Developer preview AND "Web API" shipping out of band on .NET 4 and up! Introduced Wednesday as part of .NET 4.5, includes new core WCF functionality like WebSockets, UDP multicast, improved streaming and better async support leveraging Tasks and C# async improvements. We continued our commitment to simplicity with a number of configuration improvements (read "reductions"), making WCF throttles and quotas work for developers by default, better manageability. The WCF Client programming model is included in .NET Core profile available to Windows-tailored app developer. Scott Aside: I've used WCF for years, begrudgingly. It is powerful, no one would disagree, but it's notoriously complex and scary. I'm impressed with what they've done in this release because they've effectively used the infinite configurability of WCF and pluged in a re-imagination of what WCF works like in a world of REST and JSON. When it's time for WS-* and the Enterprise, that part of WCF is still there, but when you move to the RESTful open web of 2011-2012, the new Web API is clean and light, nicely integrated with ASP.NET and able to create simple and lightweight web services using things like JSON and conventions that make sense. Dinesh announced the developer preview for RIA for JS/HTML5 in his BUILD talk. It's a set of jQuery plugins that let you easily work with server data on the client. By bridging the different tiers, RIA/JS lets you quickly build rich forms-over-data applications with HTML/JQuery. The libraries are available via RIAServices.jQuery NuGet package as well as codeplex. The WCF RIA Services for Silverlight were also updated via WCF RIA Services V1.0 SP2 and WCF RIA Services Toolkit Aug 2011 update. Here's a rollup of other related links for you, Dear Reader, with downloads at the very bottom. This week the MSDN site (http://msdn.microsoft.com) will be highlighting each of the above releases and more. We have a new landing page on www.asp.net where we will cover all of our vNext releases. You can view it at www.asp.net/vnext. This will continue to update this week as the latest preview of Web API is released and Web Matrix 2 is released. Scott Aside: I am running this side-by-side with Visual studio 2010. I've also been upgrading from internal beta build to this build and you should be able to also. A lot of work has been done to make installing VS less scary. You can certainly run it in a VM but I took the plunge and I'm running them together with no ill effects so far. Browser version numbers continue to march on. IE9 is here, IE10 is coming, Firefox 5 and 6 are here with 7 and 8 in the wings, Opera's on 11, and Chrome is on, I dunno, somewhere between 14 and 50. Regardless, we'll all be on version 99 before The Singularity. There are two ways to fix this: one is a machine-wide fix, the other is a way to fix individual sites. We're releasing a hotfix that will fix these, which you'll be able to get to via some KB articles. These KBs with fixes are live and are the best way to update your system. The fixes solve the browser-detection issue forever for all sites on a machine. These will be rolled up into future versions of the framework and will eventually also be on Windows Update. What the fixes do is update the ie.browser and firefox.browser files in \Windows\Microsoft.NET\Framework\<version>\Config\Browsers with new and future-proofed versions of these browser definitions. Nothing else is affected. If you don't have access to the whole machine and/or just want to update a single project, use NuGet to install the App_BrowsersUpdate package. Your site structure in Solution Explorer will then look like the image at right. Note that NuGet uses .NET 4, so for systems that have only .NET 2, you'll need to get the ZIP file and put the new browser files in App_Browsers manually. Note that NuGet is VS2010 specific so if you don't have nuget.exe and .NET 4, you can also copy the .NET 2 updated browser files into ~\App_Browsers manually from this zip file. Updating the whole machine is the preferred way to fix this. The fix is to get updated browser-definition files. You can install a machine-wide fix or just fix individual projects. Hotfixes are availble with download links. The files will also be part of the next batch of .NET 4 fixes, which are anticipated to ship around January 2012 via Windows Update. The next version of the .NET framework will include all the updated files. If you're interested in more detail than you need, I’ve uploaded the updated versions of firefox.browser and ie.browser files that are expected to ship with the next version of ASP.NET. The files and source is up at my BitBucket repo if you are interested in the details.